I am fairly obsessed with brown nail polish. When I was in high school, I used to search all over the mall for the perfect brown polish colors -- usually picking up tons of bottles from Old Navy and Afterthoughts! 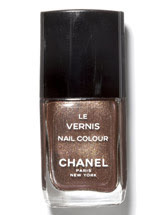 Combine that with my love for the annual Color of the Year Contest sponsored by Seventeen, in which people have the opportunity to create a nail color that could be picked up by CHANEL, and Haute Chocolat is a total winner. Created by 19-year-old Amy Gonzo, Haute Chocolat is the absolute perfect shade of deep brown that looks fabulous on tips and toes. It's run through with shimmer to really make the cocoa hue pop -- and it goes on unbelievably slick and creamy. If you're a chocolate lover, then this is totally a polish for your arsenal. It's completely and utterly unique -- I've never seen a polish like it before. And even just having the bottle in your collection is a total indulgence and luxury. This polish isn't cheap. But it's so, well, haute -- your nails will be gorgeous for days on end. And look at it this way -- you'll have a piece of the design house for way cheaper than the quilted black leather handbag with chainlink strap! I recently got a shade from OPI that looks a lot like this one.. It's a dark purplish/brownish with some shimmer- and cost $7. might be an alternative?